Are you searching for a pressure cooker, slow cooker or air fryer? You’re in the right place. 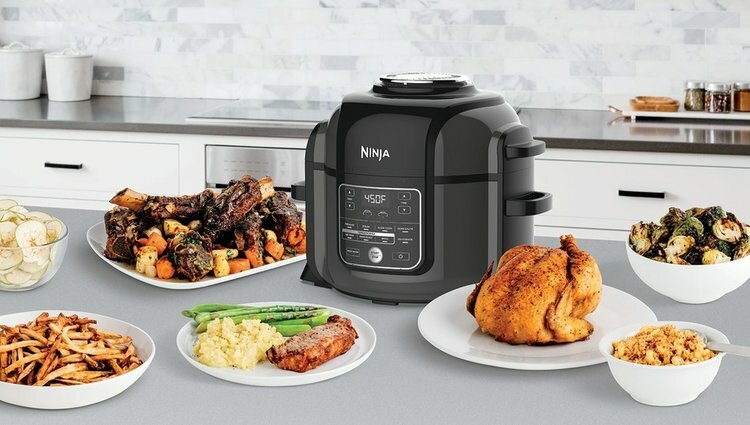 The Ninja Foodi Multi-Cooker combines all these functions and more, including steam, bake, roast and grill. 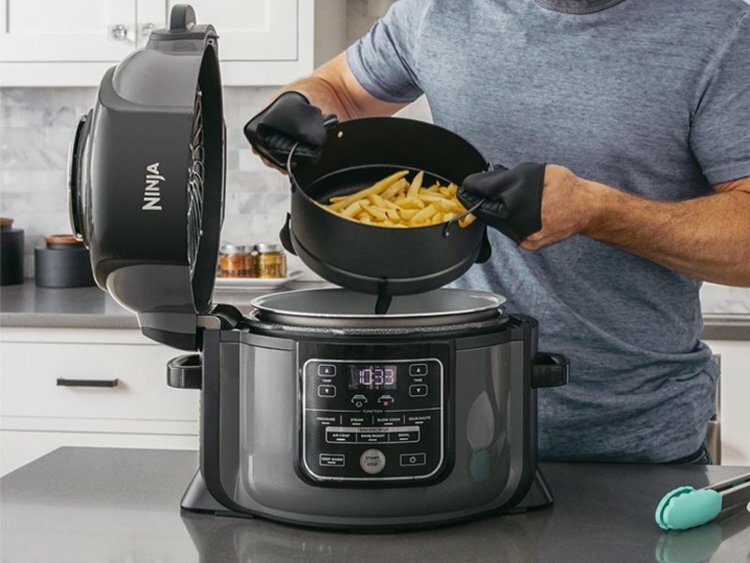 Featuring TenderCrisp Technology, this one-pot wonder is the only pressure cooker that crisps.Simply pressure cook to lock in juices and finish with a golden crisp. Multiple cooking functions in one pot. Pressure cook, air fry, slow cook, steam, bake, roast and grill your way to delicious, easy meals in a fraction of the time. One Pot Meals – Cook mains and sides at the same time with the Reversible Rack. Layer grains and vegetables with meat, fish or protein for complete, easy meals. Air Fry – Enjoy guilt-free fried food, using up to 75% less fat² than traditional frying methods. Fluffy, golden chips, golden vegetable crisps, crispy chicken wings and more. Grill – From tender chicken breasts to grilled asparagus, enjoy healthy grilled mains and sides. Slow Cook – Dinner can be prepared up to 12 hours in advance and ready when you get home, from slow pulled pork to casserole and risotto. Pressure Cook – Quickly cook tender, juicy meals in minutes, from one-pot chilis to meaty steaks and indulgent desserts. Bake/Roast – Enjoy golden roast potatoes, Mediterranean vegetables and roast dishes fit for Sunday dinner. Sear/Sauté – Lightly brown your favourite steak, caramelise onions before cooking and sauté your favourite ingredients. Steam – Gently cook delicate fish, vegetables and grains while retaining their texture and taste. Easy to Clean – Ceramic-coated, non-stick, dishwasher-safe parts make washing up easy. Includes a large 6L cooking pot and a 3.6L Cook & Crisp basket, holding up to 1.1kg of French fries or a whole 2kg chicken. Ceramic-coated, non-stick dishwasher-safe parts make washing up easy. Inspiration is included with a recipe guide in the box.